If you think a Chihuahua doesn't have much in common with a Rottweiler, you might be on to something. In other words, man's best friends may have originated from more than one ancient ancestor, contrary to what some DNA evidence previously has indicated. "Both the Belgian find and the Siberian find are domesticated species based on morphological characteristics," said Greg Hodgins, a researcher at the University of Arizona's Accelerator Mass Spectrometry Laboratory and co-author of the study that reports the find. 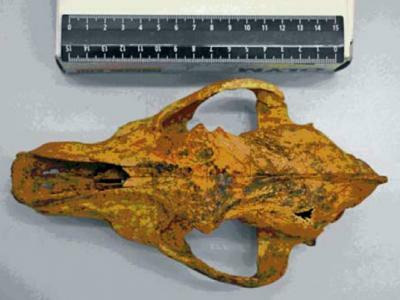 The Altai Mountain skull is extraordinarily well preserved, said Hodgins, enabling scientists to make multiple measurements of the skull, teeth and mandibles that might not be possible on less well-preserved remains. "The argument that it is domesticated is pretty solid," said Hodgins. "What's interesting is that it doesn't appear to be an ancestor of modern dogs." The UA's Accelerator Mass Spectrometry Laboratory used radiocarbon dating to determine the age of the Siberian skull. Animals and humans take in carbon-14 by ingesting plants or other animals that have eaten plants. "Carbon-14 makes it into all organic molecules," said Hodgins. "It's in all living things." 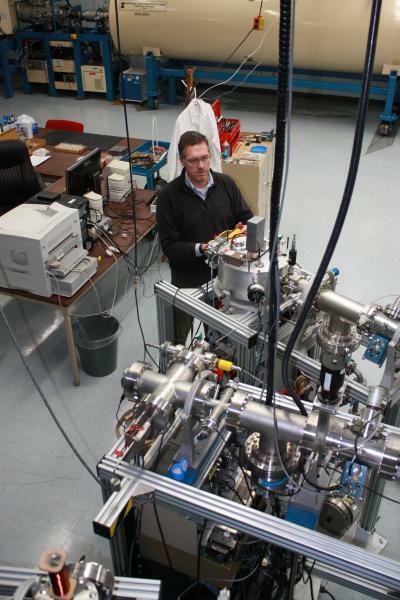 "We believe that carbon-14 production is essentially constant over time," said Hodgins. "So the amount of carbon-14 present in living organisms in the past was similar to the levels in living organisms today. When an animal or plant dies, the amount of carbon-14 in its remains drops at a predictable rate, called the radioactive half-life. The half-life of radiocarbon is 5,730 years." "People from all over the world send our laboratory samples of organic material that they have dug out of the ground and we measure how much carbon-14 is left in them. Based on that measurement, and knowing the radiocarbon half-life, we calculate how much time must have passed since the samples had the same amount of carbon-14 as plants and animals living today." The accelerator mass spectrometer generates a beam of carbon from the sample and passes it through a powerful magnet, which functions like a prism. "What emerges from it are three beams, one each of the three carbon isotopes," said Hodgins. "The lightest carbon beam, carbon-12, bends the most, and then carbon-13 bends slightly less and carbon-14 bends slightly less than that." The relative intensities of the three beams represent the sample's carbon mass spectrum. Researchers compare the mass spectrum of an unknown sample to the mass spectra of known-age controls and from this comparison, calculate the sample's radiocarbon age. "In terms of human history, before the last glacial maximum people were living with wolves or canid species in widely separated geographical areas of Euro-Asia, and had been living with them long enough that they were actually changing evolutionarily," said Hodgins. "And then climate change happened, human habitation patterns changed and those relationships with those particular lineages of animals apparently didn't survive." "The interesting thing is that typically we think of domestication as being cows, sheep and goats, things that produce food through meat or secondary agricultural products such as milk, cheese and wool and things like that," said Hodgins. "Those are different relationships than humans may have with dogs. The dogs are not necessarily providing products or meat. They are probably providing protection, companionship and perhaps helping on the hunt. And it's really interesting that this appears to have happened first out of all human relationships with animals."